I virtually always mention when I am about to write about a record that someone sent me to review to help distinguish them from the records I actually buy. I'm not sure where that need comes from, but it is just one of those things I do. When I opened up the package containing this record I very much did a book/cover/judgment sort of thing based on the artwork. It just didn't look like the sort of record that would be up my alley. That being said, if you send me a full length record to review, damn it, I will review that record. Luckily The Enemy Of Everyone was much better than I thought it was going to be. That's not to say that I love this record or that it's the sort of see I can see myself listening to all that often. It is heavier and more 70's glam rock leaning than I typically like. But, it is way poppier and catchier than I would have anticipated from the art. There are a lot of big, crunchy guitar riffs, some strong vocals and the drumming is really tight and locks down this entire record. That's probably due to Dale Crover of the Melvins on drums. Not that I'm really much of a Melvins fan either, but that guy sure can hit those drums with those sticks pretty good. The albums starts out with a bang and "Casuually Intense" is arguably the best song on the album. It's one of those upbeat and infectious songs that has a way of making you nod along whether you realize you were doing it or not. The rest of the album is hit or miss for me. The slower sludgier songs aren't really my bag and some of the faster ones drift a little too far into glam for my tastes as well. 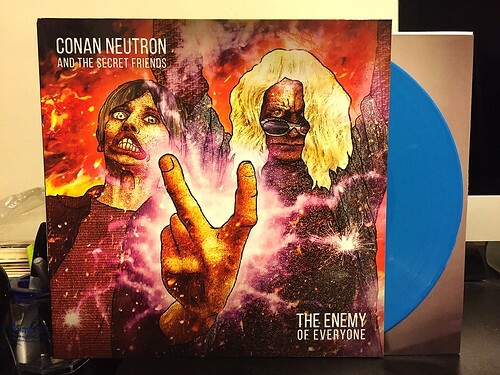 While someone with more of an affinity for heavier bands would probably enjoy this record a lot more than me, Conan Neutron And The Secret Friends doesn't really captivate me in a way that would make me go back and listen again and again. It's not bad (OK, the song "Fight Math" is kind of bad, but it's really the only one), it's just not really the sort of thing I tend to spend time with.